I’m happy to announce that my new monograph, Ceremonial Storytelling. Ritual and Narrative in Post-9/11 US Wars, was released with Peter Lang a few days ago. Initially designed as a series of close readings about soldier blogs written from deployment in Afghanistan, the project quickly expanded into a discussion of the public discourse about war experience, civil-military relationships, and military firsthand writing on the wars in Afghanistan and Iraq. Especially fascinating was the perspective of scholars, medical practitioners, and civic activists on the role of firsthand reports about war experience in Native American warrior traditions. It seems that, in postulating the ‘forever wars’ of Vietnam, Afghanistan, and Iraq as social crises, many Americans come to understand psychological injury and PTSD as a social issue, rather than a personal affliction. Consequently, the book observes how civic activists and activist scholars promote Indigenous warrior traditions as role models for non-Native American veteran reintegration and health care. They particularly stress the role of ritual and narrative for civil-military negotiations of war experience and for trauma therapy. Applying a cultural-comparative lens, this book reads non-Native soldiers’ and veterans’ life writing from post-9/11 wars as “ceremonial storytelling.” It analyses activist academic texts, “milblogs” written in the war zone, as well as “homecoming scenarios,” that is, multimedial texts and performative practices in which returned veterans share their war experiences with civilians in a ceremonial setting. Soldiers’ and veterans’ interactions with civilians in these texts and scenarios constitute jointly constructed, narrative civic rituals that discuss the meaning of war experience and homecoming. The monograph follows an American-cultural-studies approach but also draws on ideas, concepts, and methodologies from literary theory, Native American studies, (new) media studies, (new) military history, cultural history, psychology, ritual studies, narratology, and cultural anthropology. I will present select aspects of the project, namely observations on the popular depiction of US soldiers as “warriors,” at the annual meeting of the German Association for American Studies in Hamburg in June. I’m glad to announce that two articles from my research on veterans and war narratives have been released recently. This work is part of the larger research initiative “Selbst-Bewusste Erzählungen” on the interrelations of textuality and social relevance in contemporary US literature and culture, originated as a research collaboration between TU Dresden and Leipzig University. One article, “’To Put Others Before Yourself’: Volunteerism and Mental Health in US Veterans’ Projects,” discusses two NGOs organized by and for veterans to analyze how their activism responds to the sense of social crisis prevalent in these public debates on veterans’ affairs (The Mission Continues and Team Rubicon). It presents the projects’ online self-representation and their documentation in activist scholarship and journalism to carve out how civic engagement in veterans’ affairs challenges the traditional myth of American individualism to promote volunteerism and community service as vehicles for reintegration, promoting – and enacting – the civil-military social contract. The other article, “’Writing Yourself Home’: US Veterans, Creative Writing, and Social Activism” explores how public discourse about civil-military relationships, war experience, and trauma, simmering since the domestic divisions over Vietnam, turned to first-person narratives in recent years to discuss the psychological costs of war and homecoming. It interprets the proliferation of veterans’ writing projects as part of a civic activist movement that seeks to address veterans’ social and emotional struggles through community (re)building and social therapy. The writing projects promote themselves as a means to bridge the experiential gap between civilians and veterans and, in doing so, they enact social reintegration. The manuscript for the project’s main publication, my second monograph Ceremonial Storytelling. Ritual and Narrative in Post-9/11 Wars, was recently submitted to Peter Lang Publishing and will be released in their American Culture series. Earlier this month, my colleague Volker Benkert published the German-language conference collection, titled Feinde, Freunde, Fremde?…. My contribution further develops ideas laid out in these early blog posts. Other contributions cover transatlantic comparative analyses of genocide, German-American cultural transfer, perspectives on the US in East and West Germany during the Cold War, and German-American relations until today. Initially, I had intended the series on Indian imagery in German nativism and immigration on this blog to be a minor spin-off following my dissertation research. Recent events, such as the growing influx of refugees since 2014, the rise of nationalist, nativist, and racist political organizations, and their increasing visibility in public discourse, however, merit more deeper explorations of the issue. It seems that protagonists in these public debates not only recycle Indian imagery and argumentation from the Nazi era, but that growing exchange and interrelation among similar political currents across Europe also shares and disseminates related imagery, such as references to Native Americans and Indigeneity. Our Leipzig-Dresden research initiative, running under the German title “Selbst-Bewusste Erzählungen,” announced the completion of its projects. The group has worked together since 2011. Its collaborative research resulted, among other works, in two essay collections and an international symposium in fields related to post-classical narratology, i.e., a cultural perspective on textuality and social relevance in contemporary US literature and culture. Among its services, Dresden’s state and university library SLUB offers the opportunity to republish older articles and essays in open access format. After permission was secured from the original publishers, SLUB services uploaded PDF files of most of my early publications on Saxony’s document server QUCOSA. I have updated my publications page with links to these PDFs today. I am glad that a colleague reminded me of this option to thus increase the international visibility and accessibility of my work. A few permissions still need to be acquired, and most of my more recent works are still subject to a one-year protection period. Links to these texts fill hopefully follow in the coming months. Given its strengths and weaknesses, I am very happy with this opportunity. QUCOSA does not promote the texts, I still rely on the original publisher’s and my own PR efforts. However, I am not subject to a strict one-on-one share system and the texts are not hidden behind a paywall. A few days ago, another huge project was finished. Starting in 2012, my Leipzig colleagues Gabriele Pisarz-Ramirez, Anne Grob, Maria Lippold and I prepared a conference on “Selling Ethnicity and Race.” The conference, held in November 2013 at Leipzig University, discussed “the production and performance of ethnic and racial identities as well as the consumption of ‘ethnic’ and racialized products in the complex field between representational politics, economics, and consumerism, […investigating] new emerging ethnic imaginaries and the ways in which they respond to the re-invigoration of ethnic identification and to the increased visibility of nonwhite Americans in the United States.” We invited scholars from the fields of cultural anthropology, history, ethnic studies, cultural studies, and Native American studies from the US and Germany, to discuss these issues. Although, or better, because it was not immediately related to my current research projects in its thematic outline, I loved this project as it forced me to go deep into unfamiliar territory. Working on the introduction to bundle these various approaches and disciplines into a coherent work, we discussed theories of ethnic marketing, forms of capital (e.g., cultural, social), border studies, consumerism, and commodification. Our collected case studies explore examples from Native American, Asian American, and Hispanic communities. My own contribution to the project drew from my current work on Native American military traditions and warrior imagery, focusing on a case study I had wanted to research since my graduate work at the University of Arizona in 2000. My essay discusses the all-Native Immigration and Customs Enforcement (ICE) unit called the “Shadow Wolves,” stationed at the Tohono O’odham reservation in southern Arizona. To a large extent, the text employs Nancy Leong’s concept of “racial capitalism” to argue that most media representations of the Shadow Wolves cater to popular notions of Indian super-scouts. Newspapers portray the Native officers’ tracking and scouting techniques (known as “cutting for sign”) as their―supposedly inheritable and unique―racial capital. Scholarship on the Shadow Wolves is scarce; most works focus on border issues, particularly the militarization of the border after 9/11. Only a few of those, and none of the media articles I analyzed, address the political significance behind the ethnic composition of this unit (although all state the fact): The Tohono O’odham assert their sovereignty by insisting on an all-Native unit in exchange for allowing the federal government to permanently station an ICE unit on the reservation. Over the course of my research on the Shadow Wolves’ expertise, I became intrigued with their record of tracker training courses across the world: they served in Eastern European countries during the expansion of the EU, in Central Asia, and on the Arabian peninsula. Some of these tracker courses seem to be part of EXBS (Export Control and Related Border Security), a US program within an international agreement to counter smuggling and terrorism and to enhance international collaboration of security forces. For my interest in warrior imagery, I would have loved to see the correspondence by which American representatives suggest the use of Shadow Wolf instructors to foreign diplomats, especially the way their tracking expertise is advertised. Unfortunately, it seems that these documents―if they are available at all―are subject to a FOIA request, and the scope of this article didn’t allow for such a rather time-consuming process. A few weeks ago, my dissertation was published as a monograph. It is titled Fellow Tribesmen and was produced with Berghahn Books in New York in collaboration with the German Historical Institute in Washington, DC. The defense in 2010 was a major stepping stone, but this moment really feels like completion. I have developed first ideas for the project during my abroad year at the American Indian Studies Program at the University of Arizona in 2000, so these past fifteen years from inception to finished product felt like seeing a child grow up, cradle it, guide it, loose sleep over it. The analogy fails once I say ‘now that it has come of age I’ll let it go,’ but still, it has been my baby for quite a while. I don’t even think I’ll completely let it go. Many other PhDs I discussed dissertations with grew tired of their project, and told me they could not stand talking or thinking about it any more once they had defended. 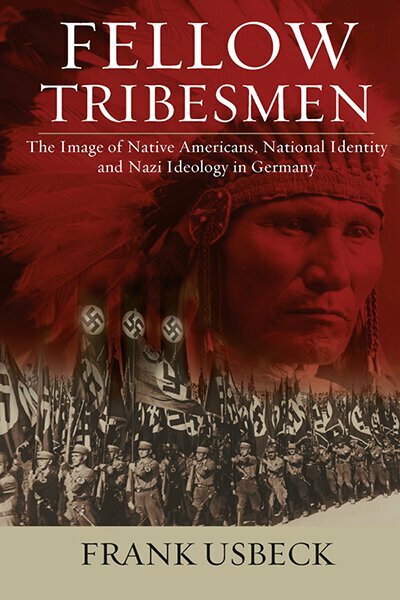 However, the German perception of Native Americans, with all its fascinating aspects of Native visitors to Europe, transatlantic comparisons in imagery, identity formation, and stereotyping, as well as implications for German/American cultural history, media history, and the history of ideas will probably recur throughout my academic life and I cannot imagine becoming tired of discussing these issues. Although, as a German researcher in American Studies, you’re supposed to put the dissertation project aside eventually and create a very broad portfolio rather than becoming a topical specialist, there are a few more aspects to the project that I’d like to investigate some time: More research should be done in German government documents regarding Native Americans. Back in the process of outlining the project, I believed I would write about German soldier’s encounters with Native American GIs. This proved to be a needle in the haystack. Then I became interested in the Nazis’ plans for occupying America, and how German Indianthusiasm would influence Nazi military planning. This proved to be way too big to pursue on top of the investigation of the range of published print sources, both journalistic, popular culture, and academic, that this project was already engaged with. “Keep it for the book,” some older colleagues said. Well, when I prepared the manuscript for publication, I was already mired in this new major project on milblogs, which left no time for extensive additional archival research for the first monograph. I hope that, some day, I can go after sources on German spies, colonial planners regarding German perceptions of Indigenous peoples in the Americas. Now, though, I’m happy. I’ve learned a lot about editing and publishing, often became frustrated about specific aspects of the process, or felt that, instead of engaging with a lengthy editing process, I needed all my time for the new project. Colleagues and friends have frequently heard about this. These days, though, I celebrate.